[Mid-season] The most popular fresh market cherry. Large, dark red cherry with excellent flavor and firmness. Considered a good shipping cherry. Requires pollinization by Black Tartarian or Rainier. Tree is large and vigorous. Requires 700 chilling hours. Harvest date approximately May 20th. 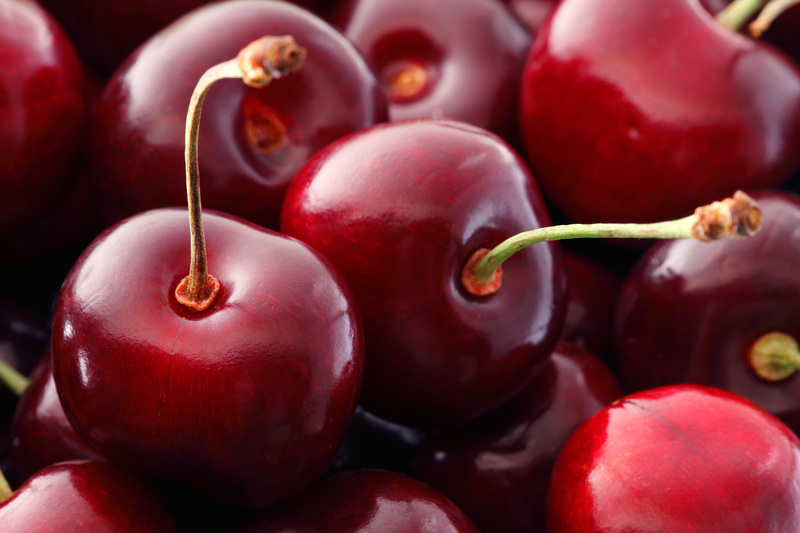 [Early] A very popular species of sweet cherry. Large purplish-black cherry. Ripens early. Pollinates with Bing and many other sweet cherry varieties. Harvest date approximately 14 days ahead of Bing. [Early] Large, moderately firm, low acid, sweet rich and well balanced fruit. Dark Red Cherry. Flesh is firm and crisp. Very susceptible to rain cracking. Has very few spurs and doubles. Harvest date approximately May 13th. [Early] Medium to large very firm fruit. The best flavor results when the fruit is mahogany in color. May be incompatible with Mahaleb. Tree is moderately vigorous on Mazzard with a spreading growth habit. Tree is found to be precocious and drought and stress sensitive. More doubles than Bing. Harvest date approximately 9 days ahead of Bing. Champagne [Mid-season] Large to very large, low acid cherry with glossy dark flesh and sweet flavor. Taste is very similar to Bing. Tree is considered a precocious grower and a heavy producer. Susceptible to rain-cracking similar to Bing. Bing and Brooks work well as pollinizers to Coral Champagne. Harvest date approximately May 15th. 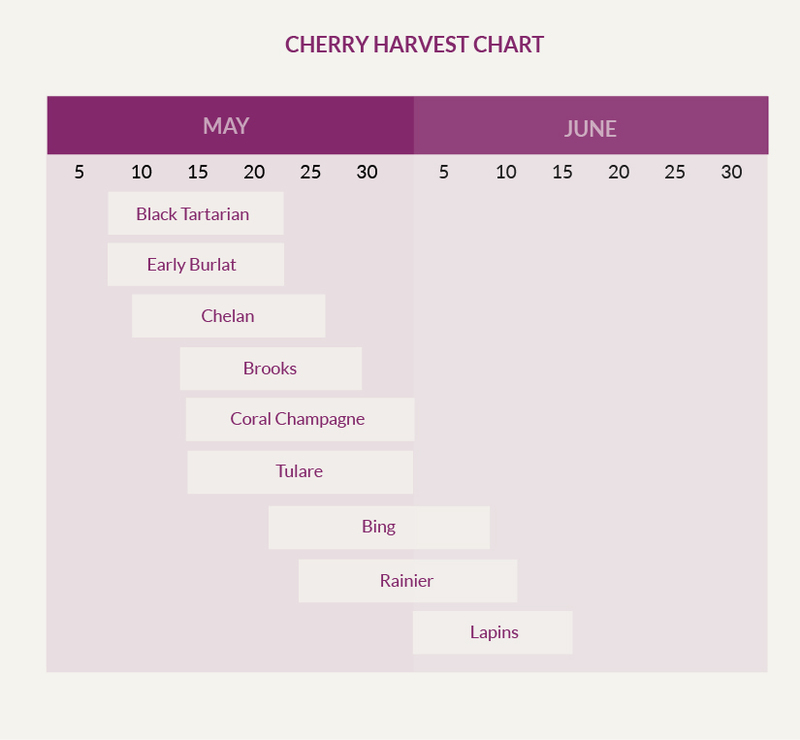 [Early] Early Burlat is an early season cherry well known for consistent productivity of Bing-like cherries .The Early Burlat cherry is medium-sized, firmer than Black Tartarian but softer than Bing. This variety needs a pollenizer and is often used to pollinate Bing. Harvest date approximately 14 days ahead of Bing. [Late] Large, firm, low acid fruit that sets in tight clusters. Let fruit hang to develop best flavor. Tree is vigorous, upright with a narrow crotch angle and very productive. Heat can soften the Lapin cherry. This variety is susceptible to mildew. Harvest date approximately 7 days after Bing. [Mid-Season] Noted for outstanding flavor. Large yellow cherry with a pink blush. Tree is vigorous, early bearing and an excellent producer. Bing, Black Tartarian, and Lapin make excellent pollinizers. Requires approximately 700 chilling hours. Harvest date approximately May 25th. [Mid-Season] Moderately large heart shaped fruit with good flavor. Fruit is dark red and may not be as firm as Bing. Has few spurs and double and does show some suturing. Tree is moderately vigorous and upright in growth with a spreading growth habit. Harvest date approximately May 15th.